I had been cautioned prior to my arrival that the Japanese are very firm rule followers. Tonight was a prime example, though I’ve had multiple other experiences with this in my limited time in Japan. 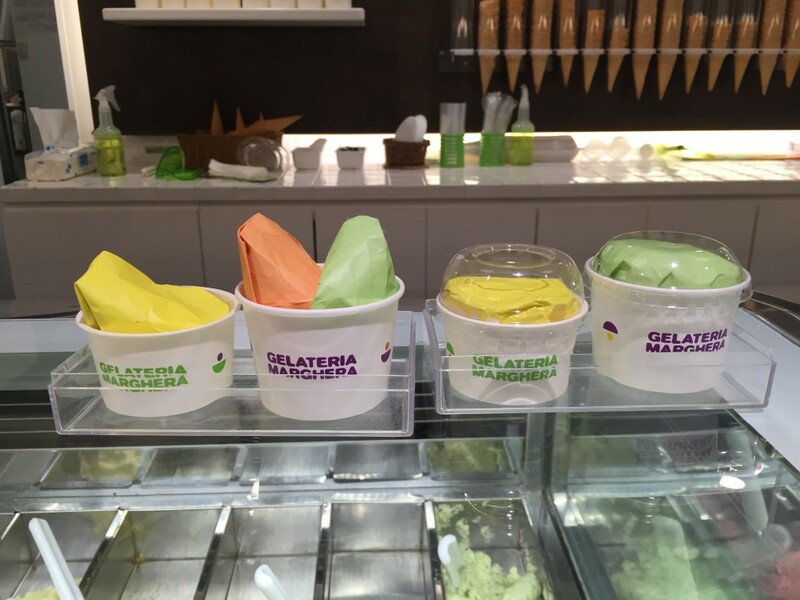 On the way home this evening from my son’s swim lesson, we stopped at the local gelato store. He got a small cup (allowed one flavor) and I was asked if I wanted it “take-away”, which I did. 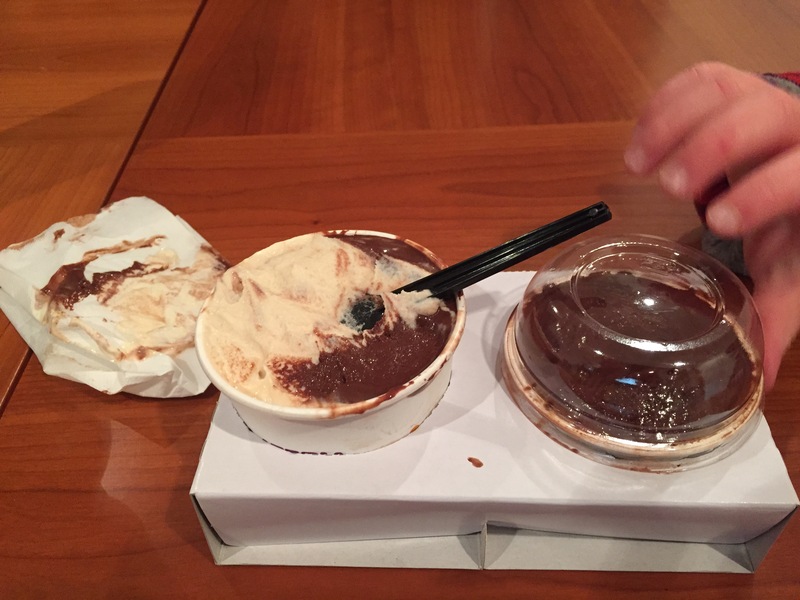 The server then meticulously packed the gelato deep into the cup, leveled the top and wiped away any drips, before placing a domed plastic lid on top. I then ordered the larger cup (two flavors allowed) and was told that take-away was not allowed with two flavors. I would be allowed to walk out of the store with the gelato, but could not be given a lid. I ordered my two flavors anyway and was handed a mounded cup of gelato. I proceeded to pack the mounded gelato down myself, but had to put a napkin on top as the server wouldn’t give me a take-away lid (despite no extra charge for the lid). Granted, this interaction was completed via broken English and Japanese and lots of gesticulation, but I’m fairly confident that we both understood what the other intended to say. At least it was near freezing outside so my gelato didn’t melt under the stroller on the remaining 6 minute walk home! Update: I went into the gelato store tonight (March 23, 2015) and saw that they have a visual representation of this rule. I hadn’t noticed this earlier when I tried to get my lid for two flavors. I still am curious to the real genesis of the rule. I have a theory it is because they don’t want the flavors to get mixed on the spatula when they pack it down to put the lid on. What do you think is the reason for the rule? We stored our three bags while we went skiing one day. Bags had to be of a specific larger size to be able to be stored in the location. Two of our bags were smaller than the required size, but not by much. My husband asked if they could just store them in the same location, but no such luck. So, he consolidated one bag into the largest bag, and then had to go find a locker in another location to store our medium sized bag. A restaurant had a minimum charge for credit card usage. We were under the minimum charge by the equivalent of about $0.15. We asked if they could just round our bill up to their minimum requirement or keep the money. This was not acceptable and we didn’t have sufficient cash, so we ended up buying a bottle of water so that we could pay by card. We laughed that this would never happen in the U.S. – a merchant would always take the free money! I’m curious to how this cultural trait helps or hinders Lean management practices in Japan. I would imagine this facilitates adherence to standard work – whereas more Americans or other people of other Western cultures might question standard work more readily. However, perhaps it also hinders out-of-the box thinking and innovation, which I have been told is a weakness of the Japanese as a whole-society. What do you think? What experiences have you had about cultural norms in relationship to rule adherence impacts standard work or innovation in Japan or elsewhere?